Do you know the easiest way to import MXF files to Adobe Premiere Pro CC with audio/video synchronization on Mac OS X? This tutorial shows you how to make MXF compatible with Premiere Pro CC on Mac. Sometimes when you drag the MXF video into Premiere Pro CC, it works but with no audio. You know, there’re two basic MXF types: one is those where the essence (media) is stored in the same file as the metadata that refers to it, such as Canon MXF. The other is that where the essence is stored in separate files to the metadata, while these files have external essence which you need keep the whole structure, such as P2 MXF. Well, according to Adobe, Premiere Pro CC only accepts AVI, M4V, MOV, MP4, MPEG, MPE, MPG, WMV, files. And you can easily find MXF is not there. To solve the incompatible trouble you’d better wrap MXF a native format for importing to Premiere Pro CC. To get the best quality with 5.1 sound, you can transcode MXF to MPEG-2 encoded MPG files, which maintains maximum editing quality and efficiency when working with Premiere Pro CC. 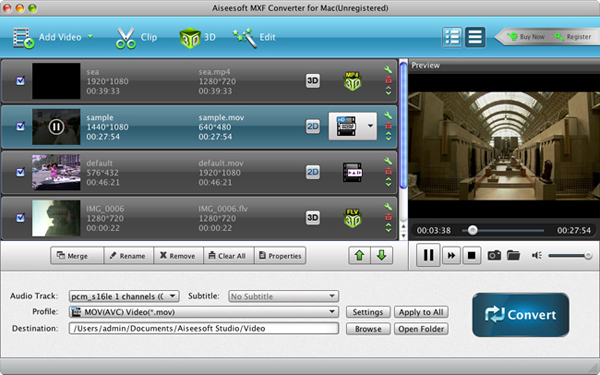 Aiseesoft MXF Converter for Mac is the professional and versatile MXF transcoding software on Mac. It can help Mac users transcode MXF files to MPEG-2 for Premiere Pro CC. This MXF to Premiere Pro CC Converter for Mac also provides simple editing functions for you and allows you to set the video/audio output parameters to get customized video effect. What’s more, you can convert MXF/P2 MXF/MTS/M2TS/TP/TRP files to editable footage for FCP, FCE, iMovie, Avid Studio, Adobe Premiere, After Effects, DaVinci Resolve, iPhoto, Kdenlive, Keynote, etc., you can even turn the 2D video into 3D with optional 3D modes and settings. For Mac MXF users, this Converter brings peerless using experience. High quality conversion with zero quality loss, unmatchable converting speed, humanized feature design, user-friendly interface and simple operation, all these are reasons why this MXF Converter for Mac worth a try. Thus, it is highly recommended on many forums. First, download and install the Mac MXF to Premiere Pro CC covnerter on your Mac. While importing MXF clips into the program for conversion, please make sure you have the entire MXF file structure as it saved on your camcorder (like a P2 Card). If you only have some loose .MXF clips, you files will have image only without audio. See MXF file structure on Panasonic’s P2 card as below. The above screenshot clearly shows .MXF clips are all saved in “VIDEO” folder, while audio files are all stored in ‘AUDIO’ folder. When you importing .MXF clips from the correct file structure, MXF Converter Mac is able to recognize audio tracks from ‘AUDIO’ folder automatically, which ensures the generated files have both image and sound correctly. Step 1. Load MXF files to the mac program. Launch the Mac MXF to Premiere Pro CC Converter, and then click “Add Video” button to import .MXF files. As you see, you should find the MXF video from one MXF whole structure folder, here I take my P2-dvcpro25 as an example: double click the P2-dvcpro25> CONTENTS> VIDEO, and then you can find the MXF file. The program supports batch conversion and allows you capture images. At the bottom of the main interface, click the “Profile” drop-down button to select the “Adobe Premiere Pro MPEG-2” as the output format. Besides, you can also choose WMV (VC-1) (*.wmv) if you want to get a relatively smaller output file. Tips: You can also click the “Settings” button and set detailed output parameters in the open window such as Video Encoder, Frame Rate, Sample Rate, etc. When you finish the settings, click the “Convert” button and begin to convert MXF to Premiere Pro CC supported format. Once the conversion is 100% completed, click the “Open Folder” button to get the converted file and then import the converted MXF file to Premiere Pro CC on Mac. This professional MXF Converter for Mac allows you to convert MXF video to kinds of NLEs, the workflow is almost the same, just choose a proper output format. If you want to import MXF to FCP X, please choose the “Final Cut Pro > Apple ProRes 422 (*.mov)” as output; For iMovie or FCE, choose the “iMovie and Final Cut Express -> Apple InterMediate Codec (AIC) (*.mov)”. 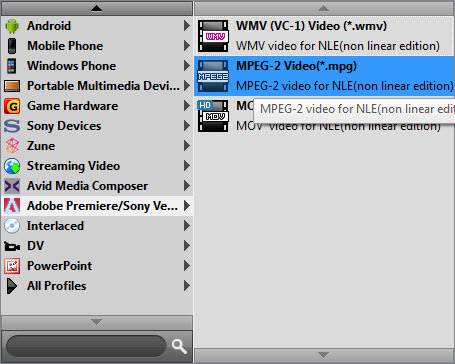 For Avid Media Composer, choose “Avid Media Composer > Avid DNxHD(*.mov)”. ← How to Sync iTunes music and movies to Nabi 2 Android tablet? 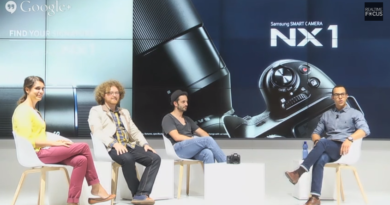 How to Decode and Encode Samsung NX1 H.265 footage to MOV, MP4, AVI, WMV for editing, burning or playing?